With Colombia through and Côte d’Ivoire needing only a win against a woeful Greece to guarantee advancing, Group C looks done and dusted. So this report is really just a retrospective on the game between the two best sides in the group. Both sides set out in the same 4-2-3-1 formations they had used in their opening games, but Sabri Lamouchi moved Gervinho from the right side to the left, replacing Salomon Kalou with Max Gradel coming in on the right. Jose Peckerman’s Colombian side was unchanged. Juan Cuadrado (Col) – Fiorentina’s Cuadrado has been a revelation for those of us not up on our Serie A this tournament, and he was not only Man of the Match in this game, but has been Colombia’s undisputed star in the absence of Radamel Falcao. Without taking anything away from a fine performance by James Rodríguez in the middle (that’s Jah-mess to you gringos), Cuadrado was simply the most exciting player on the pitch, creating danger virtually every time he touched the ball. If this is news to you (like it was to me), Michael Cox can get you up to speed. Ya Ya Touré (Civ) – So where did Manchester City’s most influential player go to exactly? Though he had a reasonable 79% (45 of 57) pass completion rate overall, that dipped to 63% (17 of 27) in the attacking third. 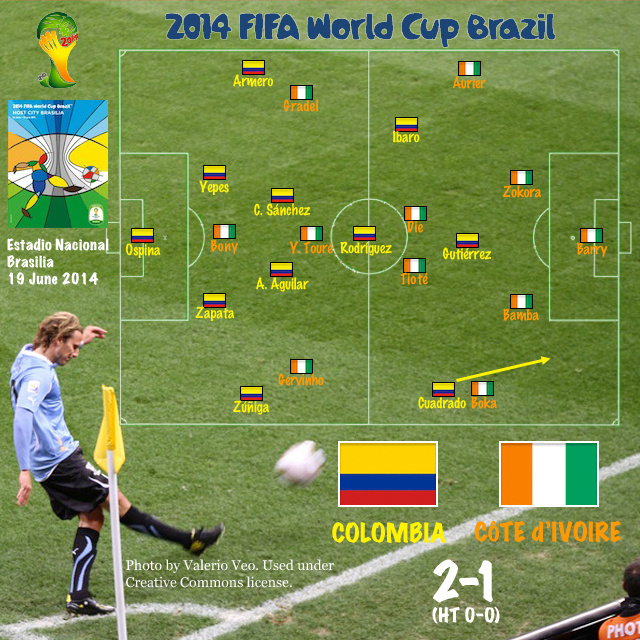 Côte d’Ivoire will need more impact from their star if they wish to compete against knockout opposition. They will certainly not win many games by chasing late in a 4-2-4 (forward Mathis Bolley replaced Serey Die at 73′ to join the attack), exciting as that tactic was for neutrals. UPDATE: The good people at FIFA have spent some of your hard-earned soccer money taking down the original Vine posting of Gervinho’s goal. I’ve replaced it with a new vine that is actually a bit better than the first. Enjoy.